Today marks the 25th anniversary of the Hubble Space Telescope, launched 24 April 1990. Operating in the optical, ultraviolet and near-infrared wavebands, HST’s low-earth orbit gives it unprecedented image quality outside of the “blurring” of the Earth’s turbulent atmosphere. HST has revolutionised our view of the universe and brought us some of the highest resolution and most spectacular images from our solar system, our galaxy and the distant universe. The real success of HST has been its amazing public reach, bringing astronomy to people across the globe. HST got off to a rather shaky start, however. There were problems with the shape of Hubble’s 2.4-m primary lens and the first images sent back to earth with disappointingly blurry! The first HST serving mission in December 1993 installed lenses to correct the optical aberration. A total of 5 servicing missions between 1993 and 2009 were carried out, replacing failed equipment and installing new instruments. With the end of the space shuttle program in 2011, further HST servicing missions are no longer possible, but NASA will continue to maintain HST for as long a they can. Some of HST’s key science outcomes have included studying weather patterns on other planets in our Solar System, studying the atmospheres of exoplanets, peering into star forming regions, studying interacting and merging galaxies, measuring the expansion rate of the universe, and views of the most distance universe 13.3 billion years ago. Each year HST releases a special birthday image. For its 25th anniversary, this year’s image is of the stellar cluster and star forming region Westerlund 2 in the Gum 19 nebula. The central star cluster contains about 3000 stars. The image combines visible light from an image taken by the Advanced Camera for Surveys with near-infrared images from the Wide Field Camera 3. The red colours represent regions dominated by hydrogen, while the bluish-green hues are predominantly oxygen. (You can also watch a 3D fly through here). Using the Atacama Large Millimeter/submillimeter Array (ALMA) telescope, astronomers have for the first time detected an extremely powerful magnetic field near the event horizon of a supermassive black hole in the centre of an active galaxy. This discovery supports the idea that strong magnetic fields help collimate the high-speed plasma jets emanating from many active galaxies. Active galaxies are characterised by a very bright central nucleus, with high and rapidly varying luminosities on timescales of hours or days, emission across a wide range of wavelengths (and are usually most luminous in a non-optical part of the electromagnetic spectrum, e.g. UV or radio), non-thermal spectra, and often have radio jets emanating from the central region of the galaxy. 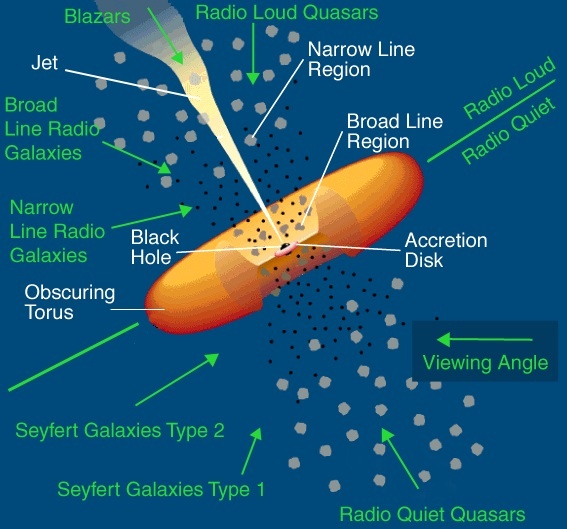 Different types of activity galaxies include quasars, Seyferts, BL Lac/blazars and radio galaxies. The central region, or nucleus, of all active galaxies are thought to be similar and are explained by the “Unified Model of AGN” (where AGN stands for Active Galactic Nuclei). The variation in AGN properties is thought to be related to the line of sight we have into the central region of the AGN. In the Unified Model, AGN have a central supermassive black hole that is fed by an accretion disk that is a few light days across and surrounded by a thick dusty torus. Radio synchrotron emission is produced in many AGN, collimated into jets that propagate outwards from the nucleus perpendicular to the plane of the accretion disc. These radio jets are prominent in many radio galaxies and can be as large as several Mpc in size. Radiation from the jet moves close to the speed of light and can be beamed, and can vary on periods from hours to days. Exactly what powers these jets is still somewhat of a mystery. It is believed that strong magnetic fields must exist close to the accretion disk, and the magnetic field lines must collimate and power the jets. Hence the recent results of Ivan Martí-Vidal and colleagues published in the journal Science are of great interest. Using ALMA, Marti-Vidal et al. detected polarised light related to the strong magnetic field at the base of the jet emanating from the distant AGN, PKS 1830−211, which is at a redshift of z = 2.5. The high-resolution ALMA observations were at a wavelength of about 0.3 mm. The high-resolution was crucial to probe the region very close to the black hole, and only millimetre wavelength light can escape from the dusty region very close to the black hole, since longer wavelength radiation is absorbed. Polarised light means that the electric field vectors of an electromagnetic wave have a preferred direction. As the polarised light propagates through a magnetised medium, the direction of polarisation can change – this phenomena is known Faraday rotation. The amount of Faraday rotation, determined by a quantity known as the rotation measure, is proportional to the magnetic field strength. The high rotation measure derived in PKS 1830-211 suggest magnetic fields of at least tens of Gauss, and possibly considerably higher, on scales of the order of light-days (about 0.01 parsec) from the supermassive black hole. “Our discovery is a giant leap in terms of observing frequency, thanks to the use of ALMA, and in terms of distance to the black hole where the magnetic field has been probed — of the order of only a few light-days from the event horizon. 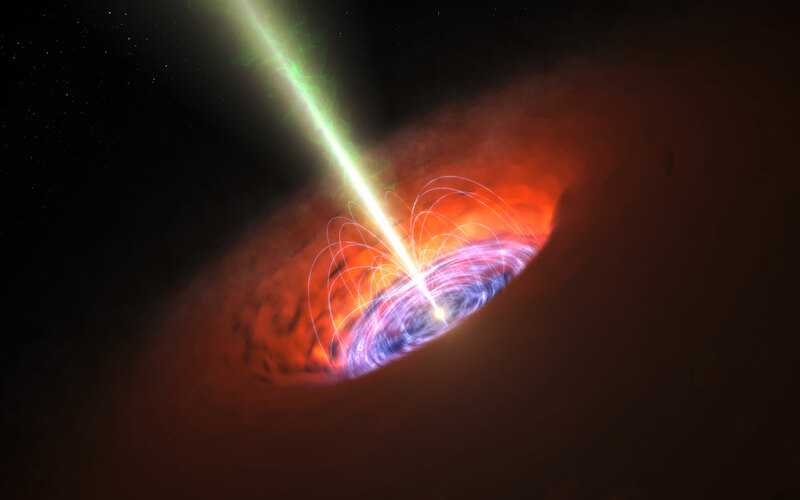 These results, and future studies, will help us understand what is really going on in the immediate vicinity of supermassive black holes.” Sebastien Muller, co-author of the Science paper. For the first time, astronomers have found complex organic molecules in a protoplanetary disk. Using the ALMA telescope, the discovery of methyl cyanide (CH3CN), cyanoacetylene (HC3N) and hydrogen cyanide (HCN) in the dusty, gas-rich disk surrounding the young star MWC 480, show that the building blocks of life are not unique to our Solar System. These complex organic molecules were detected in the cold outer regions of the disk surrounding MWC 480, in the neighbourhood of its Kuiper Belt equivalent where we expect comets and icy planetesimals to reside. Water and complex organics have been found in both asteroids and comets in our Solar System, and organic molecules have been detected in giant molecular clouds where stars form. Simple molecules like water (H2O) and hydrogen cyanide (HCN) have also been found in protoplanetary disks, indicating that some volatile molecules can either survive during the formation of disks or that they quickly form in young disks. But what about more complex organics? It was not known whether complex organic molecules could survive the energetic shocks and intense radiation that result when molecular cloud cores gravitationally collapse to form young protostars and their surrounding protoplanetary disks. This new discovery, lead by Karin Öberg of the Harvard-Smithsonian Center for Astrophysics, shows that the conditions that produce complex organic cyanide molecules must also be common around young planet-forming disks with a range of conditions. MWC 480 is a 1.8 solar mass star which hosts a massive disk (about 0.2 solar masses) in the constellation of Taurs. Being a massive Herbig Ae star, MWC 480 exposes the disk material to much higher levels of ultraviolet radiation compared to stars the mass of our Sun and the disk will also be much hotter, 2-3 times warmer at a given radius that our Solar System. Öberg et al. not only found complex organics in the outer disk of MWC 480, but determined that their abundance ratios are similar to those found in the comets of our Solar System. This implies that rich organic chemistry of that existed in the solar nebula that formed our Solar System was not unique. Laboratory experiments indicate that the chemistry which produces CH3CN also produces simple sugars and amino acids. If complex cyanides and other rich organics are common in icy bodies around young stars, and if as in our Solar System planetary migration brings this icy material to the surface of the inner rocky planets, then the conditions for life are not unique to our Solar System. The results are published in the April 9 issue of the journal Nature. Astronomers have finally found evidence of dust around a relatively “old” supernova remnant near the centre of our Milky Way galaxy. This new finding can help explain the mystery of how galaxies in the early Universe, only a few billion years after the Big Bang, can contain so much dust. The main elements from which interstellar dust is made – carbon, silicon, magnesium and iron – are all made inside stars and expelled into the interstellar medium when stars die. This dust is then recycled in the next generation of stars (and some of it goes into forming planets like the Earth). But stars like our own Sun, with lifetimes of about 10 billion years, live too long to be able to account for the vast amounts of dust in the early Universe. Astronomers have long believed the answer to this riddle lies in supernovae explosions that result when massive stars die. The accelerated timescales on which these explosions take place can potentially explain the early dust content in the Universe. There is one problem with this idea—supernovae explosions are some of the most energetic events in our Universe. A single supernova can briefly outshine an entire galaxy! While these conditions are necessary to fuse the heaviest elements in the Universe, supernova explosions and their resulting supernova remnants are very violent environments and it was unclear whether dust grains could survive the shocks and reverse shocks that reverberate in the surrounding medium. In July of last year, researchers published new results from the Very Large Telescope which observed dust formation in real-time over a 2.5-year period following the explosion of supernova SN2010jl. Their observations showed that an accelerated dust formation process begins just a few hundred days after the explosion, producing grains as large as 1 micron in size—large enough to be resistant to destruction. These larger grains should still be observable after many years. 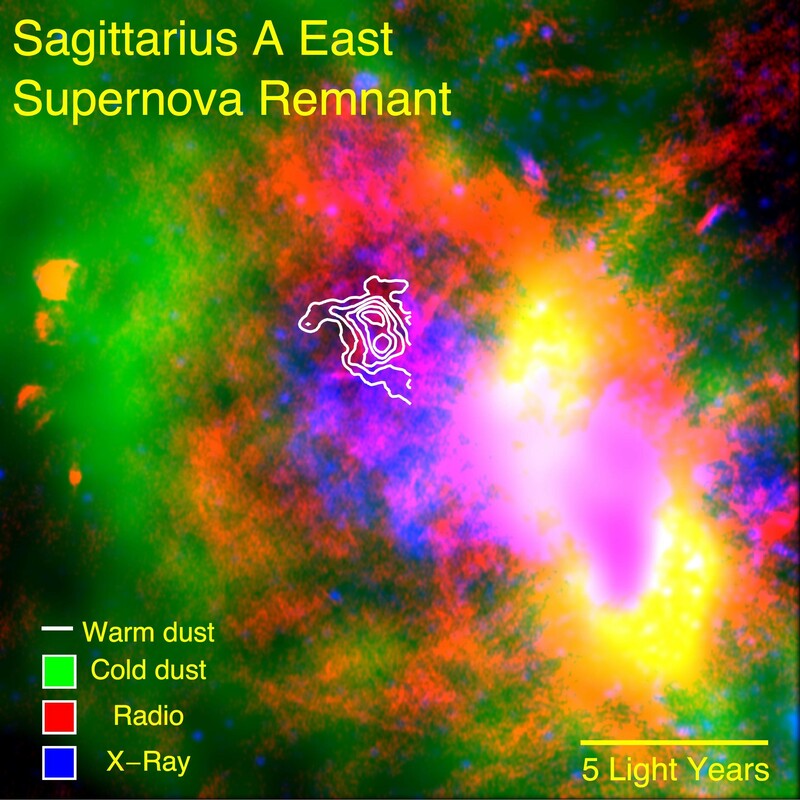 Using the mid-infrared camera on the Stratospheric Observatory for Infrared Astronomy (SOFIA), a modified Boeing 747 that flies at an elevation of 12 km, Ryan Lau of Cornell University and collaborators found an “old” supernova remnant, Sagittarius A East, near the Galactic center which contains about 6,700 Earth-masses of warm (~100 K) dust. Sagittarius A East is about 10,000 years old which means that the dust has survived the destructive shocks and reverse shocks created from the initial supernova explosion. The results of Lau et al. supports the theory that galaxies in the early Universe can indeed be enriched with dust by supernovae, which could solve the long-standing mystery. 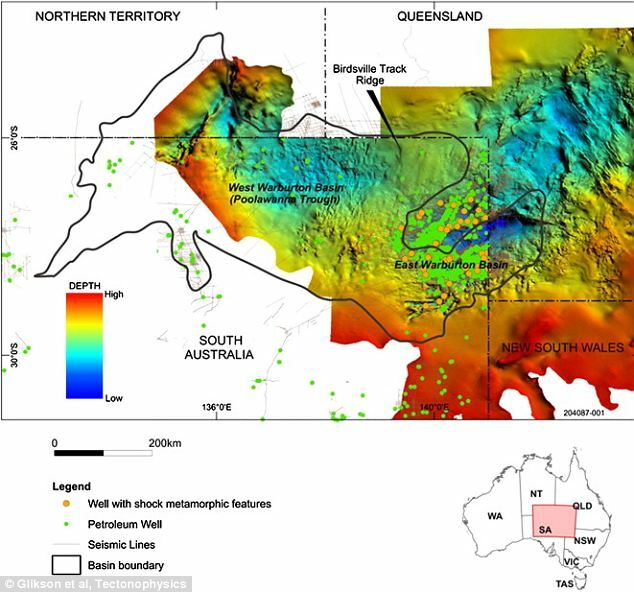 Studies of drill core rock samples up to 2 km below the ground in north-eastern South Australia, Queensland and the Northern Territory suggest the largest asteroid impact zone yet found (Glikson et al. 2015). The impact zone was found in the ~400,000 km2 Warburton Basin (that has East and West sub-basins) in two parts, each 200 km wide, potentially forming a total 400 km diameter impact area. The asteroid that created them may have been as large as 10 km in diameter, before splitting into two and then striking the Earth. The evidence of the impact was discovered during drilling as part of geothermal research, in the Warburton Basin. The impact zones seem to extend down through the Earth’s crust, to the mantle. The surrounding rocks are between 300 and 450 million years old, suggesting a similar age for the impact event. Quartz grains have been found that have layers that are curved or bent which can be caused by (normal) tectonic deformation or by crustal rebound due to an impact. Such shocked quartz is considered a tell-tale sign of an asteroid impact. Both the Warburton East and Warburton West Basins also have large magnetic bodies at depths of 6-10 km, and gravity anomalies. Seismic studies suggest fracturing of the crust to 20 km depths or more. One of the suggested scenarios that could explain the geology is a large asteroid impact that has caused central uplift in the area, causing the removal of Devonian (419-359 million years ago or 419-359 Ma) and Carboniferous (359-299 Ma) strata. Around this time period Australia, South America, Africa, India and Antarctica were joined into the Southern Hemisphere continent of Gondwana. Part of the interest in the Warburton Basin findings is the relationship between large asteroid impacts and mass extinctions on Earth. When large (km-sized) asteroids hit Earth, usually at very high velocity, dust and debris rain down, disrupting the climate and causing extinction on a global, rather than local, scale. Arguably the most famous impact event is the K-T (Cretaceous-Tertiary boundary) event. It is typically related to the disappearance of dinosaurs on Earth. At this time all large vertebrates on Earth suddenly became extinct about 65 Ma, the end of the Cretaceous Period. As well most plankton became extinct, and land plants were diminished. This event marks a defining moment in Earth’s history. The K-T extinctions were worldwide, affecting all the major continents and oceans. The K-T impact crater is a roughly oval geological structure called Chicxulub, deeply buried under the sediments of the Yucatán peninsula of Mexico. The structure is about 180 km across, and the igneous rock under Chicxulub contains high levels of iridium. Iridium is usually rare, yet in rocks near the boundary it is concentrated and abundant. Meteorites have a similar, high abundance in iridium. There is evidence of mass extinctions around the inferred time of the Warburton Basin impact. One of the five major extinctions events that have affected Earth’s biota occurred ~360 Ma. Three quarters of all species died out in this Late Devonian mass extinction, though past research suggests a series of extinctions over several million years, with two main periods, rather than a single event. In particular the Kellwasser Event (about 375–360 Ma) marks when 50% of all genera went extinct. Major victims included ammonites, brachiopods, corals, jawless fishes, sponges and trilobites. The primary Devonian reef-builders (tabulate corals and stromatoporoids) never truly recovered from the extinctions and the changes in reef ecology were profound for at least 100 million years. The recent results of the Warburton Basin suggest more study and further exploration is required. “When we know more about the age of the impact, then we will know whether it correlates with one of the large mass extinctions”, says research team leader Dr Andrew Glikson. Up to nine new dwarf galaxies close to the Galaxy and the Magellanic Clouds have recently been found. Three of the new objects are definitely dwarf galaxies whilst the others may be fainter dwarfs or even globular clusters. Imaging data taken from the Dark Energy Survey (DES), a five-year effort to photograph a large portion of the southern sky, has been analysed and these new objects were found. Two separate teams of astronomers (eight objects reported in Bechtol et al. 2015 and nine reported in Koposov et al. 2015) announced these findings after looking at the first year of DES data. The closest of these new objects is 97,000 light-years away, about halfway to the Magellanic Clouds, in the constellation Reticulum. The most distant and most luminous of these objects is 1.2 million light-years away in the constellation Eridanus. The newly discovered objects are a billion times dimmer than the Milky Way, and a million times less massive. Their dimness and small size makes them incredibly difficult to find. Automatic object finding software is used to detect slight stellar overdensities. Colour information can then be used to filter out background stars to produce a candidate dwarf galaxy. Why are these discoveries significant? These ultra-faint galaxies are the smallest, least luminous and most dark matter dominated galaxies known. Most simulations of structure formation, using cold dark matter, predict hundreds of dwarf galaxies should be in orbit around the Galaxy. Until recently, only about 30 dwarfs were known. The current DES results increase this number by about 30%. The complete 5 year DES survey area is predicted to contain between 19-37 dwarf galaxies. It is unclear what the total number of dwarfs linked to the Galaxy is, due to incompleteness in depth (faintness) and sky coverage of various surveys. Thus it is still unclear the discrepancy between the number of dwarfs detected and that predicted by simulations. Strangely, the majority of dwarf galaxies in orbit around the Galaxy appear to lie on a “great circle” on the sky. That is they do not seem to be isotropically distributed around the Galaxy. Recently, similar (planar) distributions of dwarf galaxies have been detected around our Local Group neighbour M31 (Andromeda), and many dwarfs appear to have the same sense of rotation about their host. It is not yet clear whether these peculiar dwarf galaxy distributions are caused by ‘normal’ structure formation or other processes. Koposov et al. and Bechtol et al. both suggest that some of the new dwarfs found in DES may have been associated with the Magellanic Clouds in the past (harking back to previous suggestions of this nature by Donald Lynden-Bell in the mid-1970s). Perhaps they are Magellanic dwarfs not Galaxy dwarfs. Finally, the dominance of dark matter in dwarf galaxies make these objects excellent targets for indirect dark matter searches. Dark matter annihilation produces gamma rays. Geringer-Sameth et al. (2015) have looked at Fermi-LAT data for the newly discovered DES dwarf, Reticulum 2. They detect a signal between 2 GeV and 10 GeV that exceeds the background. The detection is between 2.3 and 3.7 sigma, depending on the background model used. Despite this uncertainty, Reticulum 2 has the most significant gamma-ray signal of any known dwarf galaxy. Other sources of gamma rays (e.g. a background extragalactic source, or internal millisecond pulsars or young massive stars) still need to be ruled out. A collaboration of astronomers, lead by Darach Watson from the University of Copenhagen, have discovered one of the most distant galaxies to date named A1689-zD1. The galaxy is at a redshift of 7.5, which means it is about 13 billion light years away and the light we detect is from when the Universe was only about 700 million years old. However, A1689-zD1’s distance is not the only thing that makes it interesting. The discovery of A1689-zD1 was made possible by the existence of a gravitational lens that magnified the light of the galaxy by a factor of 9.3. Gravitational lenses are created when massive foreground objects – like galaxy clusters – distort space-time around them. When this happens light no longer travels in a straight line, but is bent around the intervening massive object, as if the light had passed through a convex lens. Depending on the object’s position behind the lens it can appear multiply imaged (Einstein cross) or is smudged into an arc of light around the lens (Einstein arc). Without gravitational lensing it would be very difficult to observe galaxies at the distance of A1689-zD1. This is because the light emitted from A1689-zD1 is redshifted quite a bit by the time it reaches an observer on Earth. Redshifting of light occurs because the Universe is expanding, and as light travels through space it is literally stretched along with space. When light is stretched its wavelength becomes longer. Light that has longer wavelengths is redder. Light from very distant galaxies is fainter than that from similar galaxies closer to us at first order due to the inverse-square law (but at such extreme distances other cosmological dimming effects dominate). Therefore, the light sent out from A1689-zD1 is very red and faint because it has had to travel such a large distance to reach us. The other reason A1689-zD1 is important is because of its properties and how they were determined. Watson’s team observed A1689-zD1 using two instruments. The first instrument was the X-shooter spectrograph, which is part of the Very Large Telescope in Chile. A spectrograph spreads a galaxy’s light into a spectrum, similar to how a prism spreads white light into a rainbow. The amount of light in each part of the spectrum reveals several characteristics about the galaxy. Sometimes astronomer note a chunk of the spectrum is missing, which occurs when material is absorbing light emitted at those wavelengths. Schematic of an absorption spectrum, showing how intervening gas can “remove” specific transition lines from the resulting spectrum. Galaxies that are vigorously forming stars have such a chunk missing from their spectrum because young stars emit light at a wavelength that is just right to be absorbed by the neutral hydrogen in the galaxy. When hydrogen absorbs light, this boosts its energy and the hydrogen atoms undergoes what is called an energy transition. The strongest of these transitions is called the Lyman-α transition. The wavelength where this transition occurs is where light will be missing from the galaxy’s spectrum and is called the Lyman-α break. Because the galaxy’s light is redshifted based on how far it has travelled, astronomers can measure the wavelength the break occurs at in the galaxy and therefore determine how far away it is. The spectrum of a galaxy is also very important because it allows astronomers to determine the age of the galaxy, the mass of the galaxy, and estimate its star-formation rate, which is how many stars it forms each year. Watson’s team found thatA1689-zD1 is quite a typical galaxy; it is not forming stars at an alarming rate and its mass is on the light side (much less than our own Milky Way galaxy). The other tool used to study A1689-zD1 was the Atacama Large Submillimeter Array (ALMA), which can be used to measure the dust content of the distant galaxy. When stars evolve and die, they eject their material into space and enrich the galaxy with new elements. After many cycles of star formation, the galaxy will become enriched with dust and hence dust is a characteristic of a mature star-forming galaxy. When Watson’s team observed A1689-zD1 with ALMA, the galaxy appeared very bright, indicating the it contains a significant amount of dust. But now there was a conundrum; the amount of dust detected within the galaxy is much larger than expected for its age (since many cycles of star formation are needed to build up the dust content of a galaxy). This indicates that the galaxy must have been forming stars for a long time, which is tricky because the Universe itself is not that old at this point – recall that the light we detect from A1689-zD was when the Universe was only about 700 million years old). Alternatively, it must have under gone a very intense period of star-formation, where its star formation rate was very high for a short period of time and during this short timeframe the stars in the galaxy could have produced a lot of dust. This is not the first time astronomers have discovered objects that appear to be much older than expected at high redshift. Last year, Caroline Straatman of Leiden University found a population of very mature compact galaxies at a redshift of 4, when the Universe was 1.6 billion years old, which means they too must have been vigorously forming stars while the Universe was very young. This shows how little we still know about the early universe and the first galaxies. Understanding the formation and evolution of these distant galaxies is one of the main goals of astronomers, but is only possible if these objects can be detected. Hopefully, in the next decade more advanced telescopes will allow astronomers to look back to these epochs and answer fundamental questions about the galaxies which populated the Universe 13 billion years ago.